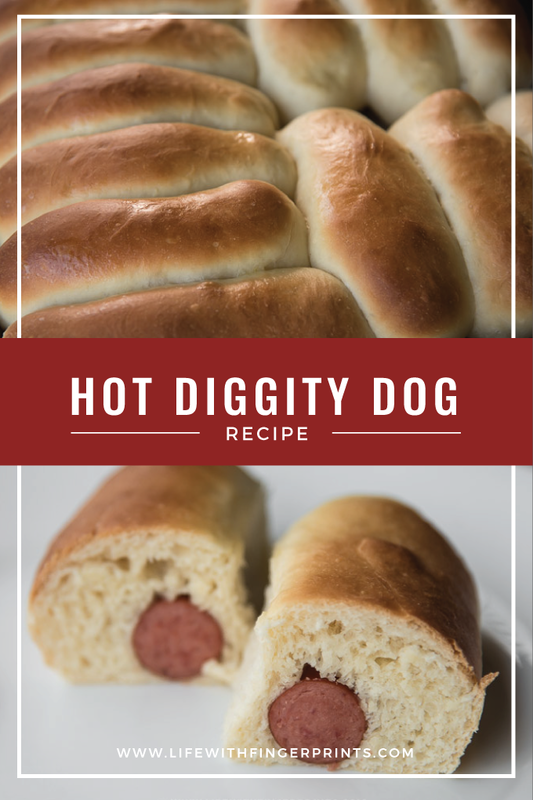 If I were to think of the food my childhood – it would be these: Handmade dough lovingly wrapped around hot dogs that somehow gained the name Hot Dog Diggities…or Hot diggity dogs…I’m not sure where the name came from and I’m not even actually sure what the real name was, but they were a favorite. They were enough work that my mom didn’t make them all the time, but I remember a number of times requesting them on my birthday – they were the special meal because…well, fresh bread I suppose. Any meal with fresh bread is a treat. When we were first married, I started making them because I had more time than money and the leftovers fed us for days. They soon became Steve’s favorite as well. I know a lot of people have variations of these – pigs in a blanket – wrapped in pre-made crescent dough but these will knock them out of the park. And as I’ve mentioned before – Costco all beef hot dogs are the only ones I use. Combine water, yeast and 1 tbsp sugar in a small bowl. In a larger mixing bowl, combine butter, salt, eggs and one cup of flour. Start mixer. Once yeast is bubbly, add to mixing bowl and add another cup of flour. Mix well. (Using the whisk attachment). Switch to the dough attachment and start adding the rest of the flour until the mixtures makes a soft dough. It may be more or less than 7 cups of flour. Cover and let rest until it doubles in bulk. 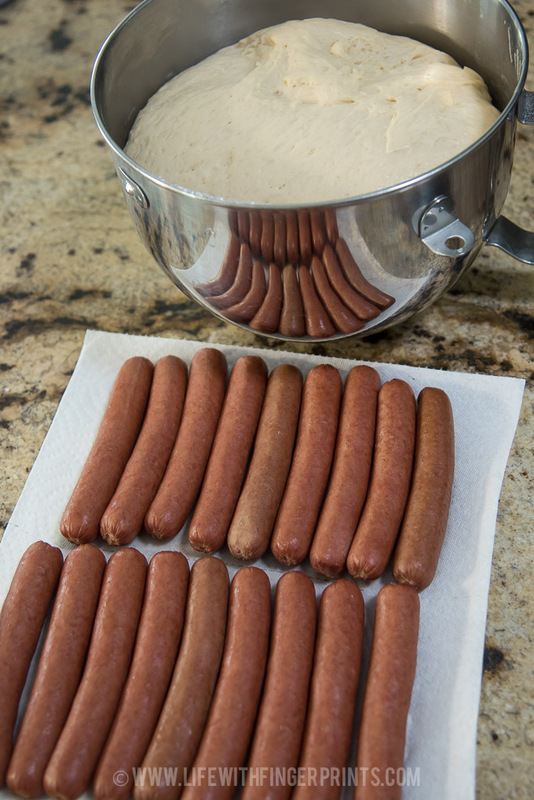 Once dough has nearly doubled, cook the hot dogs in a pot of boiling water. 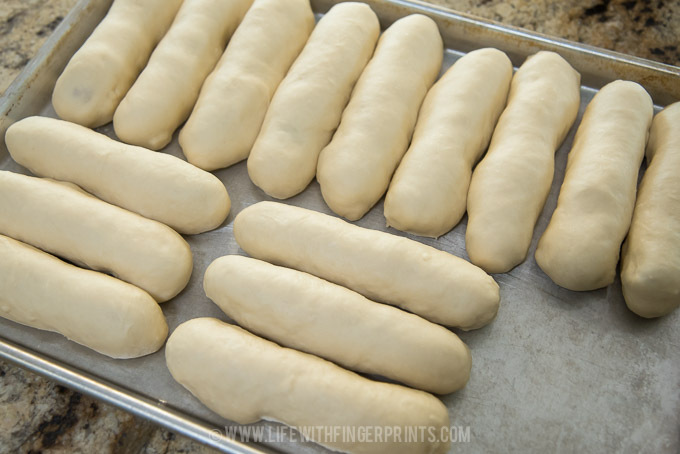 Take a small ball of dough and pull it to the length of the hot dog and start to cover the entire dog. Place them on a greased sheet, not touching. Let them rise again. Bake at 375 for 15 minutes. I was looking for an easy meal for a busy thursday evening. I saw this and I was excited to try. It was a bit of work, but my kids loved them. I took them to a lady who just had a baby and they loved them as well. I made enough to stick in the freezer for a quick lunch on the go. Definately will be making these again! They are some work, which is why people often take the easy way out and buy refrigerated crescents. After I started making them I understood why these weren’t on the two week meal rotation! They do make great leftovers – in fact I’m having them for lunch today!